There was tension in Auchi in Edo state after suspected Fulani Herdsmen attacked and massacred the bus driver of Gloryland school. The youths of the community with the aid of vigilantes – tracked and caught the attackers who were said to be heavily armed with charms and locally made guns. Some group of Fulani herdsmen massacred a school ( gloryland group of school) bus driver along Auchi road, it prompted the youths of igarra town nd other nearby villages coupled with vigilantes to swing into action. 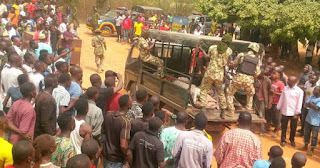 They were able to capture those devils heavily armed with charms and locally made guns. They were eventually brought to the police station this morning. The youths were protesting for them to be killed, that led to another brouhaha, the men of the Nigerian Army were called into the scene, when they arrived, the youths were still demanding for them to be killed, it brought about an altercation between the army nd youths, the army fired heavy gunshots into the air to clear further disagreement. Those of us at igarra, be very vigilant nd security conscious. They might just come back re-enforced, fulani people don’t accept defeat,their fight is like a bush fire during harmattan. But they Ve forgotten that this is EDO state, heartbeat of the nation, we no dey carry poooosh.